Mr. Khajornjate Boottala, General Manager, would like to welcome you. Located in the center of Chiang Mai, the second largest city in Thailand and only 10 minutes from the airport. Mercure Chiang Mai offers you comfortable rooms with free WIFI for your business and leisure stay. Book conferences, seminars and social events for up to 600 people with parking available. Our restaurant and bars will tempt you with a range of delicious dishes and a relaxing atmosphere. Supermarket and banks are available next door. Guests can easily access the nearby tourist attractions such as elephant riding and bamboo rafting. Chiangmai's famous Night Bazaar is one of the city's highlights which is only a 15 mins walk to the Walking Street Market held every Sunday. Situated on the Mae Ping River basin, Chiang Mai is Thailand's second-largest city. Chiang Mai's streets are steeped in its rich history, with its architecture and famous landmarks reflecting the diverse past and fascinating traditions. All-day dining venue featuring International buffets and all-day dining menu choices. 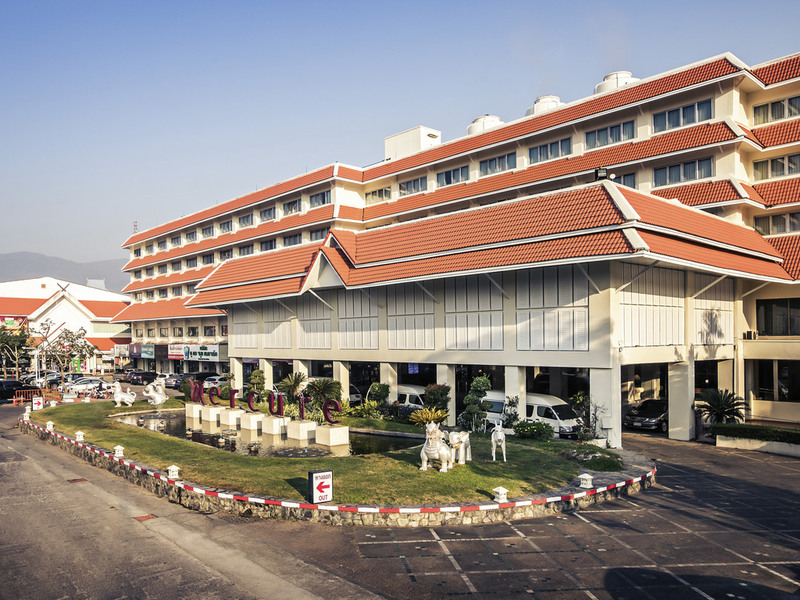 I would normally stay at a 4/5 star hotel, but I like the Mercure Chiang Mai and have stayed there a few times, I like the staff , rooms and the service the hotel provides, the airport pickup the evening shuttle service etc. The only thing I would like to improve would be the breakfast, I find it a bit basic, but that is what a 'Mercure&quot; breakfast is I suppose. We had a great time in chiangmai . And enjoyed our stay with you . We thought the shuttle bus was a great idea ,as we had not stayed at a hotel were this service was available. Your staff were very helpful and always had a smile and a warm welcome. The fault we could find ,was the water was not hot enough for us .But then again we like out water hot . Thank you all for a brilliant stay . Terry and Hope L.
We stayed with you for 10 days,our room was allowed 1 bottle of water each per day(knowing you couldn’t use tap water)I think that is poor!! Our coffee was not topped up,we had two sachets in the room only for two people. The sheets had black stuff on them...and the bathroom wasn’t cleaned efficiently. A lot of the staff were on their phones(which is unprofessional) and it always seemed inconvenient when we asked a question!! The concierge were however bright and bubbly,would go above and beyond to provide a wonderful service,they are an asset to your company!! We stayed in hotel 3 years in a row. Last year, it was disappointed with dirty towels, ants everywhere and unpleasant odour in the corridor. This year, all these disappointed are gone. Clean towels and with floral scent in the corridor. Really great! I will remain as loyalty fans of this hotel. Keep up all staff! You have done a good job! Dear Wailingwinniew, Thank you very much for taking time to review our hotel and it is very pleasure for us to have you return to enjoy further quality time with Mercure Chiang Mai again. We are truly delight to hear that this time you were enjoy the service and amenities as we strive to provide the best quality service to every our valued guest also you had seen improving service better that last time and it touched to your satisfaction while you were staying with us!. Your motivation words is the most importance to be drive and inspiration to every staff here, Definitely share to everyone!. Thank you again for coming back to us, we hope that we would have another opportunity to welcome you to the hotel next time when you travel in Chiang Mai. Please do not forget to let us know when you would like to return back. Sincerely yours, The Management Team. Very noisy at night when new guest get to there rooms yelling up the corridor at midnight people are asleep. New guests need to be aware that people are sleeping and to be considerate of others. Dear F. E., Thank you for taking the time to tell us about your experience at the Mercure Chiang Mai. I am sorry that your experience did not meet your expectations regarding to your sleeping was not good so far. At Mercure, we strive to provide a superior service experience for every customer; therefore your feedback is very important to us. Please rest assured that we are taking the appropriate measures to address the problem and prevent future occurrence. We appreciate your sharing your concerns, and it is our hope that you will give us the opportunity to better serve you in the near future. Sincerely, The Management Team. The local of the hotel is OK for walking to the old city. The hotel is old, but in OK standard compared to the room rate charged. The only major issue is the old, noisy and not so easy to adjust A/C. This has an impact on the quality of your sleep. Very convenient with the supermarked next door. Friendly staff. Happy to recommend. Dear Global44343192640, Thank you very much for your candid review of your recent stay at our hotel. Your feedback is extremely valuable to us, as we strive to improve with each and every stay. I greatly appreciate your comments about aspects of the air condition that need updating. It is a pleasure to announce that we will be implementing many of these upgrades to the property within soonest. In addition, We are happy to read that the location and supermarket were convenient for you, Your kind compliment about staff will pass on to them for motivation them do better service constantly. Also you had nice days in Chiang Mai. Thank you again for choosing to stay with us and recommend our hotel. We hope that we would have a chance to give the better service in next opportunity. The Management Team. I am a professional musician. I was happy to see a reasonable Yamaha Grand Piano tucked away to one side of the Lobby area of the hotel. I asked politely on two separate occasions if I could play it quietly for a few minutes at a quiet time of the day of managements choosing .. I explained that I was a professional musician. I was refused both times. Am a regular visitor to Chiang Mai but will not stay here again. Dear Maestro, Thank you for choosing to stay with us and bringing your concern to our attention. We are sorry to hear that the piano service did not meet your expectation because of the musical instrument all the right reserved for the private personal musician only. We deeply regret that we are not able to let you playing it, your valued comment will make us improve on our shortcoming soonest. We hope that we would have another opportunity to welcome you back again in the future. The Management Team. A pleasant, spacious room with a modern bathroom - both spotlessly clean. Very welcoming and friendly staff and good location. However restaurant a big disappointment - prices double what you pay outside. Located a 20 min walk from edge of Old city and another 15 mins to Walking Street Sunday Market and 20-25 min drive from Night Markets. Shuttle to Night markets first leaves at 7 pm so limited access. Taxi and Tuk tuk drivers at hotel hold you to ransom. Hotel has all the ambience of a hospital ward and breakfast was uninspiring. Our room faced directly into large block of flats so hundreds of people just stared straight at our room. Very limited dining options around as in semi industrial type area. Only one sad looking massage place nearby. It is also the only Accor property in the world that offers only a soft drink voucher as a complimentary drink for its valued loyalty club members. There were other problems with our room and I immediately asked for the manager to contact us and they never did in our 3 day stay. Not good enough. Go for location over loyalty and stay on other side of town and closer to night markets. Warm welcome from the reception, bell boy, and room keeping. Though a bit old-looked room but clean.Recommend to change towel because there were too old. I stayed 2 nights, not consecutive nights, room on 3rd floor was better than 2nd floor. Dear Wander67548504987, Such positive feedback is extremely valuable to us, since it encourages our team members to deliver the very best experiences from the start to finish of each guest’s stay. However please accept my sincere apology for any inconvenience caused especially about old towel. I feel it was indeed a tad unfortunate that you were disturbed on this occasion. It will be a pleasure for us all to have you return to enjoy further quality time at Mercure Chiangmai when you next visit Chiang Mai. Nice big hotel located near old city. Great staff and good food. Overall clean but the windows would need to be cleaned as they were quite dusty. We will come back to Mercure Chiang Mai for next trip. Dear Sunshine55336154041, In regards to the detailed comments you have provided us and the overall rating, we sincerely regret that your experience in our hotel did not totally reach your expectations more especially in term of dusty windows. Your constructive feedback about dusty will be also shared to the teams and deeply reviewed and improved. Once again I sincerely apologize for any dissatisfaction you experienced, and do hope that we will have the pleasure of showing you the very best of our hospitality in the future. good service with first impression. the hotel have a good employee the most of is the reception at the counter are very very nice. the room are good the area of a hotel is good we would like to recommend to any body. The hotel is a bit outside of the old town area (about 10 minutes walk to the old city river). The hotel staff is very courteous and provide a complimentary upgrade of the room. While the hotel is clean and the room is spacious, it is a bit outdated just like other reviewers have mentioned. For the price, though, it is right at what I’d expected. I wouldn’t think it as a 4-star hotel but more like a 3 star hotel. The breakfast is just okay. Nothing to be excited about certainly met the expectation with the price range. Staff were very nice, extremely helpful with all we needed. We loved Patty at the restaurant she always had a smile for us and looked after us very well for our 5nights, we watched how she dealt with some very rude customers, Patty was polite & Graceful in her dealing with those horrible people while giving them what they wanted. Well done Patty. This hotel is too old with less quality of amenities as well. Breakfast was simple. Nice staff is a good point.